• 3-3/8" Housing Depth – lowest profile ENERGY STAR® fan available – fits anywhere! Mounting Opening (in sq. ): 10-1/2"
Grille Size (in sq. ): 13"
WhisperValue® DC™ Fan with multi-speed for ASHRAE 62.2 compliance allows you to select the proper CFM settings to satisfy ASHRAE 62.2 continuous ventilation requirements. It is the lowest profile ENERGY STAR® rated ventilation fan available. Ideal for residential construction (Single & Multi-Family) and Manufactured Homes. It features Panasonic’s revolutionary DC motor with SmartFlow™ optimum CFM technology, and incorporates a Pick-A-Flow™ speed selector switch to customize airflow (80-100 CFM). WhisperValue® DC™ FV-0810VSS1 Fan is the perfect multifamily solution; also ideal for single family and manufactured homes. As the lowest-profile ENERGY STAR® certified fan available, it actually fits in a 2x4 stud bay. 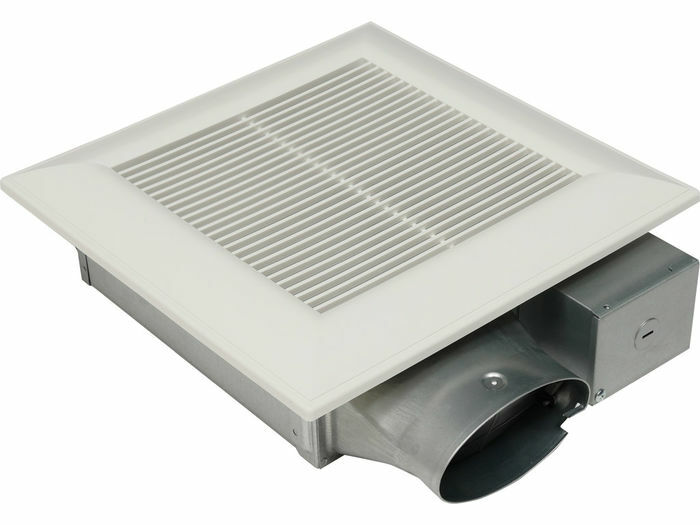 The low profile, 3-3/8” housing depth and unique L-shaped bracket allow this fan to be installed virtually anywhere - in ceilings or walls. The revolutionary DC motor with intelligent self-adjusting SmartFlow™ technology senses the amount of resistance in the duct run and automatically adjusts the fan speed to deliver the optimal CFM output, even in the case of a complicated duct run. The Panasonic DC motor with SmartFlow technology moves more air using less energy, so the fan is more energy efficient and lasts longer. Built-in Pick-A-Flow™ speed selector provides the unique ability to select your required airflow (50-80-100 CFM) with the simple flip of a switch. Being able to choose the proper CFM level gives you the flexibility and assurance that one fan will satisfy a range of ventilation design requirements and perform as promised, even with a complicated duct run. Unique L-Shaped bracket simplifies installation and provides strong support. The L bracket is interchangeable to be positioned to either the left or right side stud for optimal fan placement. Optional 4 in. Oval to 3 in. Round Duct Adapter(FV-VS43R)* is available to give you flexibility in duct layout and design. Panasonic fans are also UL listed for tub/shower enclosure (just install them on a GFCI-protected circuit). With these great features, your installation options open up. * Refer to the Accessories Tab for more information on the 4 in. Oval to 3 in. Round Duct Adapter(FV-VS43R), sold separately. The Transfer Register Box (TRB) was designed exclusively for use with WhisperValue DC fan and fan/light combinations. It provides room-to-room air distribution with ductless heat pumps. The 4" Oval to 3" Round Duct Adapter was designed exclusively for use with WhisperValue DC fan and fan/light combinations to provide installation flexibility in duct layout and design.